Michael Wigley’s folk band, ‘Meditation’, performed ‘The Journey’ – a delightful harmonising of songs and readings following the life of Jesus. It was a relaxing and uplifting afternoon listening to talented performances from Pat Ezra, Janice bright, Cathy Pargeter, Thom Friedlein and Michael Wigley. Joanna, Denise and Mary from CAFOD Brentwood, would like to thank all the members of Mediation, past and present, for their generosity of time and talents given in performances all over the Diocese on behalf of CAFOD. A special ‘thank you’ must also go to the Community at Chigwell Convent for their hospitality and to Sr Patricia for her help on the day. 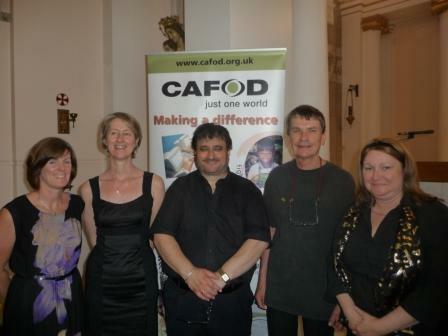 After the concert special presentations were made to celebrate the achievements of two of CAFOD Brentwood’s very energetic fundraisers: Peter Tree from Thurrock, who ran this year’s London Marathon in memory of his childhood friend, Antony Mahony, who used to work for CAFOD and Mel Cormican who cycled 3,000 miles with friend Craig Hunter, through 11 countries from Southend to St Petersburg. Both received a copy of CAFOD’s 50th Anniversary commemorative book. It is very hard to describe the wonderful performance by ‘Meditation’ but all who see and hear it find it truly uplifting. If you would like them to come along to your parish, please contact the CAFOD Brentwood office brentwood@cafod.org.uk or phone 0208 502 9722 and we will be happy to make the arrangements. This entry was posted in Upcoming CAFOD event and tagged CAFOD Brentwood, Chigwell Convent, diocese of brentwood, fundraise, Meditation by cafodbrentwood. Bookmark the permalink.